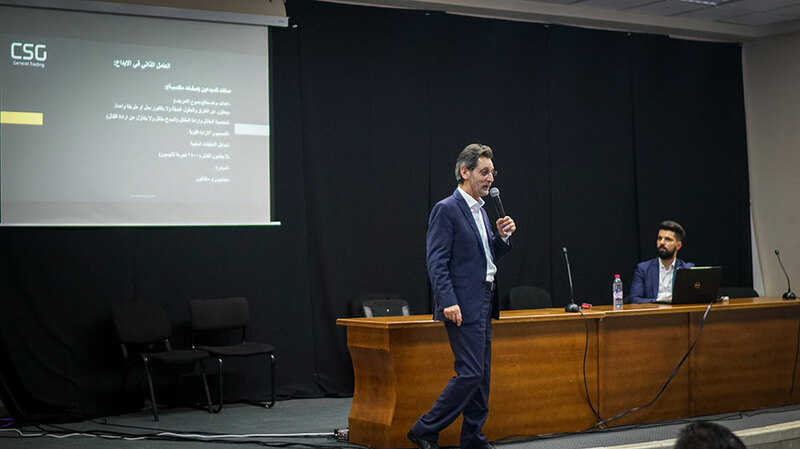 Birzeit University students and professors discussed innovative thinking with Firas Qasas, founder and owner of Consulting Services Group, a Palestinian company providing design solutions, in a public lecture on Birzeit University’s campus, on Tuesday, February 12, 2019. Drawing on years of experience in providing implementation services in Palestine and abroad, Qasas detailed the process he considers conducive to innovation in the era that emphasizes capacity building and human resource development. “Innovation is the creation of something that is useful and socially acceptable to all,” explained Qasas, emphasizing that innovation cannot lead to the development of people and nations unless it is coupled with ethics and higher standards. “To innovate, one must have clear goals, be determined yet flexible enough to adapt to changing plans or look for alternatives, and not fear failure,” Qasas noted. He highlighted contingency planning as an important aspect of the innovation process, stressing that innovators must draw up meticulous plans for every eventuality that they might face. Qasas outlined that the innovation process comprises four unique steps: Identifying the objectives, determining the parties involved, identifying the means by which innovation takes place, and setting detailed plans covering every aspect of the process.